How are objects used to communicate? Objects are used by all of us. Some people use them intuitively without knowing that they are using objects to communicate. Every time you hand someone their coat, or pick up the car keys for example, you communicate something to them. 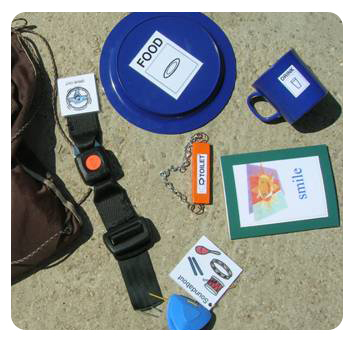 However, objects can be used very effectively in a more structured way to communicate too. The photo story below shows someone using a structured method of using objects, called ‘Objects of Reference’. or an activity (e.g. costume or towel for swimming). Objects of Reference that are used at SMILE, Redlands. Where are objects used to communicate? Objects are all around us and we use them every day. They can be more useful than speech, as words are a temporary sound. We can not hold onto words and take our time to hear them. They are gone. Photos are also not accessible for everyone. Some people may have good eyesight but are not able to make sense of the flat shiny pictures. 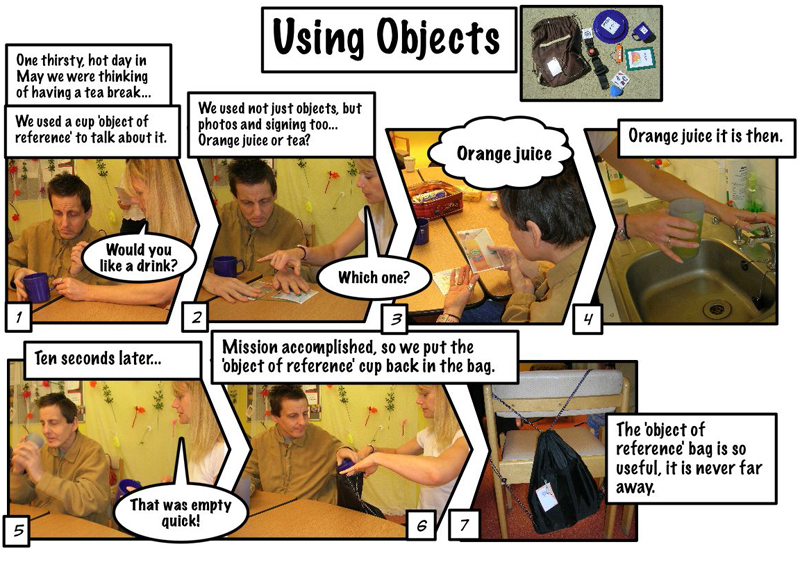 Objects of Reference are particularly useful for people with Profound and Multiple Learning Disabilities, and people with visual impairment. Where can I find out how to put together Objects of Reference for someone? The use of Objects of Reference must be closely monitored and taught, and learnt in close liaison with other members who work and live with the person with whom you are using the objects. As such, it is highly recommended to attend a day course in the use of Objects of Reference. Sadly Jeffrey passed away in 2007. You can see his photo story above. He was one of our webstars. He has left a grand legacy through his contribution to Total Communication, and his work continues to inspire and enrich peoples lives. We feel privileged to have known him. ~ Jennie de Vries, former OTC Project Leader.